The three hole pipe is an ancient instrument, dating back to the stone age. In historical times it has been popular throughout Europe and much of the Americas as a dance instrument since it can be played with just one hand, leaving the other hand free to play a percussion instrument – a drum, a string drone, a triangle.On this page I’ve collected notes and sources I’ve used to make reconstructions of 3 hole pipes from renaissance Europe. We are particularly fortunate in that there are written sources, iconographical sources, and surviving instruments from this period – meaning that very little guesswork is needed to create working modern instruments. One if the distinctive features of the 3-hole pipe is it’s bore. It is very narrow compared to any other kind of cross or end-blown flute. This is because the instrument is intended to play only in the second register and up. The narrow bore means that the higher registers play easily at the expense of the lowest register, which is not used. Almost all 3-hole pipes are cylindrically bored, since a tapered bore would be difficult to construct, and would likely be destructive to the evenness of the instruments tuning. The ratio of the bore to the sounding length is a valuable clue when looking at instruments that are incomplete. Some of the instruments below have bore ratios noted. for smaller instruments this can be as high as 40 to 1 (for a galoubet from the south of France, 285 mm sounding length, made by M. Fabre), to around 36 for the larger of the Mary Rose pipes pictured below (729 mm sounding length). “A pipe made of fruit-wood was recovered from the main deck of the Mary Rose. close to a cabin which is known to have been occupied by an archer, a carpenter and one other man who has not yet been identified. It was found in association with equipment belonging to the Queen’s Company of Archers. The rabbit’s foot mark (or two plumes mark, or just possibly silkworm wings) is likely associated with the family of Jeronimo Bassano, known as woodwind players and makers in Venice. 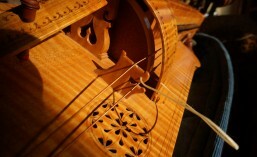 Some members of his family joined the court of King Henry VIII, so the connection with this instrument is not unlikely. Jeremy Montague confirms this in his physical study of the instrument in FOMRHI communication 1818. The wood may be boxwood. “The other almost playable instrument is a smaller pipe, one with an indecipherable mark (on which we hope to be able to report more fully in due course). This measures OL 468, Up to end 435, and all it needs is a new block.”. This is different enough from Palmers estimate to be significant. Additionally, Graham Lyndon-Jones, in FOMRHI Comm 1654 gives the length of the pipe to be 449. I asked Jeremy Montague if he could clarify this discrepancy, and he confirmed (in personal correspondence) that the correct measurements for this pipe give a overall length of 449 mm, with a sounding length of 414. Graham Lyndon-Jones gives the length to be 829 in FOMRHI Comm 1654, which adds to the confusion. He also has some images of the pipe that are not available from other sources, along with an interesting period engraving showing a pipe of this scale being used along with a fiddle of the style found in the ship. In personal correspondence, Jeremy Montague was kind enough to clarify these measurements as 829mm for the total length of the instrument, and noted that the material is cherry wood. Click here to download a full-size version of this image, scaled in Photoshop with the assumption that the instrument is 800 mm long. The image was created at 96 pixels per inch, which should allow you to print a full size image. Or download a pdf version that can be printed on multiple sheets from the free Adobe Acrobat PDF reader. I’ll be updating this information when time allows to match the revised length of 829. Quite a stretch. The ratio of the bore to the sounding length (720 / 20) is around 36. The significance of this instrument is that it was not found in close proximity to instrument #2, meaning that it was likely owned by someone else. The workmanship on the instrument is said to be poor, as is it’s condition, but Montague describes it as very close to the size of #2, implying that this was not an uncommon length. Graham Lyndon-Jones lists the length of this instrument as about 740 mm. Jeremy Montague confirms that the length of the instrument is currently 729, but is badly damaged. If the missing piece was replaced in the style of the Legros pipe (81A3901), the overall length would be around 808mm. This may contain an accurate representation of the instrument, but unfortunately the book is both expensive and hard to come by here in the states. Jeremy Montague was kind enough to summarize the information given here, and I’ve added his measurements to the sections above. The Syntagma Musicum of Michael Praetorius, 1619. Volume 2. Measured drawing, descriptive text and range. Source: The Syntagma Musicum of Michael Praetorius, Translated by Harold Blumenfield. Two Three-Hole Pipes, as illustrated by Praetorius. The larger of the instruments has a total length of 802 mm, which makes it a close match for the instrument recovered from the Mary Rose. The crook is an interesting addition, which is seen in at least 1 other surviving instrument. The smaller instrument scales to about 565 mm. Click here to download a full-size version of this image, scaled in Photoshop, scaling the instrument according to the scale attached to the illustration. A pdf version that can be printed from Adobe Acrobat can be found here. The scale was calibrated to the Brunswick Foot. The image was created at 96 pixels per inch. A Tabor associated with the above 3-hole pipes. “Here should also be mentioned the Schwegel, also called Stamentien-pipe. It has only two holes on the front bottom and one in back. It is similar in length to the transverse flute, but is blown like a recorder. The English use it together with a drum and play it with the left hand. (plate IX) It goes in range from d’ up to d'”, e'” and even further. Some are a fifth lower, from g” or a”. It is remarkable that with but three holes this instrument affords the same extent of range as instruments with six or seven holes. These dimensions do not, by the way, match the illustration for the tenor and bass pipes. Praetorius’s measurements are given in the “Brunswick Foot”, which translates to 285.35 mm. This would put the Brunswick inch at 23.77. Praetorius’s pitches are, most likely, Renaissance Pitch, or a = 460 (1 semitone sharp from a=440). This source alone does not provide enough information, other that the illustration of the smallest recorder, which may have 3 holes. A better reproduction of plate IX, along with more research might help shed some light. 20 Brunswick inches, or 475.4 mm. This is too small to be one of the instruments illustrated in Plate IV. No pitch is mentioned for an instrument of this voice. Instrument 3: Tenor “Stamentien-pipe”, LOA 570 mm, sounding length = 525. Key of d (ren) listed by Praetorius? LOA 565 mm. This is the smaller of the two instruments illustrated in Plate IV. Key of d (ren) listed by Praetorius? Praetorius gives a range for a tenor instrument of “d’ up to d'”, e'” and even further”. Converted from Renaissance Pitch, this would work out to a range of eb’ up to eb'”,f”’, and higher. It should be noted that the illustrations in Praetorius’s plates are usually accurate in length, but have exaggerated turning details (nescessary to make the engraving make visual sense)–I would assume that the flair of the bell would be more in keeping with what we know of the style from extent renaissance recorders. Instrument 4: Tenor “Stamentien-pipe”, LOA 618 mm. ?? Praetorius, in his descriptive text, gives a measure of 26 Brunswick inches, or 618 mm for the tenor. This is too large to be one of the instruments illustrated in Plate IV.–either this is an approximation or error on Praetorius’s part (which happens fairly commonly) or it refers to another instrument, not pictured. Instrument 5: Bass “Stamentien-pipe”, LOA 713 mm ?? Praetorius, in his descriptive text, gives a measure of 30 Brunswick inches, or 713 mm for the bass. This is too small to be one of the instruments illustrated in Plate IV. See comments above. LOA 565 mm. This is the smaller of the two instruments illustrated in Plate IX. Praetorius gives a range for a bass instrument starting at g” or a”, a fifth below the tenor instrument. (g’ up to g”’) and higher. Converted from Renaissance Pitch, this would work out to a range of ab’ up to ab'”,bb”’, and higher. It should be noted that the illustrations in Praetorius’s plates are usually accurate in length, but have exaggerated turning details (necessary to make the engraving make visual sense)–I assume that the flair of the bell would be more in keeping with what we know of the style from extent renaissance recorders. The estimated pitch based on length matches Praetorius’s pitch of g.
Marin Mersenne, Harmonie Universelle, 1636: No dimensions, but good tablature. To explain the shape, range, tablature, and the use of the flute with three holes. “Although this instrument (figure 46)can be joined with the preceding ones, because it has only three holes, that is two in front marked with 2 and 3, and the other behind marked by 1, (unless it is wished to count as first the hole of the plug A through which it is blown, the second, B, which serves as flue, and the last of the end C. so as to locate six holes) nevertheless I have wished to separate it as much by reason of its great range, as of its tablature which I give here in two ways. that is to say by the ordinary musical notes and by the marks used by those who do not understand the value and use of the ordinary notes. Now it is so easy to understand this tablature that there is no need of explanation, unless for the instruction of those who have never seen it or who do not know how to sound the flutes and the flageolet. It is then in their behalf that I first say that the notes contain the range of a seventeenth, and that I have changed the clef because one can rise only a tenth with the first clef of F ut fa, using only five lines. Here it must be noted that many do not give the first four notes in the range of this tablature because they do not pass through all the degrees of the octave, for after the fourth or the four tones ut, re, mi, fa, that form the lowest four notes of this instrument, four other notes to reach the fifth above cannot be produced to complete the octave. That is why one can begin this tablature by the fifth note, which is at the octave with the first and which occurs on G re sol so that it has only the range of the eleventh, which contains all that one can ordinarily produce with this flute. The notes which are preceded by the flat signify the alterations, the accidentals, or the semitones which are made by moderating the wind or by working the fingers by which the holes are stopped more or less so as to sound the pieces in B-flat. Now the note which is on the clef of C sol ut fa and which begins again at the bottom on the first line continues the tones which have begun on the other clef and serves as the root for completing the remainder of the range, as the notes which follow show. As to the other characters, they must be explained so clearly that there will be no need of speaking of them in the discourse on the other flutes that make use of them. The tablature given here is valuable in that it shows a three-hole scale in the English style, where the thumb-hole is tuned to produce a semitone, unlike 3-hole pipes of the French tradition (which I assume also existed at this time) where the thumb produces a whole step. The pipe shown then is in the key of G, tuned 221. (G-2 semi-A-2 semi-B-1 semi-C-) A rough experiment with an old generation 3-hole pipe in d, shows that an additional paper tube gives a total sounding length of about 400 mm, LOA of 425. G# = 390 and 415, respectively. This tablature is discussed in detail by my one time historical woodwind teacher, Graham Lyndon-Jones FOMRHI communication #1652. Posted in Historical Musical Instruments. The Quills are a early American folk woodwind, first recorded in the early part of the 19th century among Afro-Americans in the south. There are at least two kinds of woodwinds called the quills: a cane fife with several holes, and a panpipe with several separate cane pipes. They are assumed to be of African origin, since similar instruments are found in various parts of Africa, and they were most common among 1st and 2nd generation Africans in America. The Quills would probably be forgotten today if not for the extraordinary recordings by the entertainer and early bluesman Henry Thomas, made in the late 1920s. Alec Lomax and others have recorded other traditional players as well. The Quills are first mentioned in early American plantation slave histories, some dating back to the late 1700s. At that time, the instrument appears to consist of two or more cane pipes, played for recreation and dancing, accompanied by “shouts, whoops and songs”. They are mentioned fairly often in oral histories but little structural and musical information has survived. Considering how popular and common they appear to have been, it is surprising that they are almost unheard of today. Quills were also used by free blacks in New Orleans in the 1800s. Two bluesmen recorded songs with the Quills in the 1920, and a rural folk tradition has survived to this day in the American south. I’ve heard that the word “Quill” is an colonial American (and English) term for a hollow tube of any sort, but have been unable to confirm this. A number of villages in Zimbabwe and Mozambique maintained a tradition of pan-pipe playing well into this century, and a few continue to play to this day. The earliest recordings of these ensembles are from the field recordings of Hugh Tracy, who traveled through southern Africa between 1935 and 1955, making a series of exceptional recordings of traditional music. His recordings are available from the International Library of African Music (ILAM). Some of these recordings are included in the collection Flutes and Horns, which can be previewed and ordered from this web site in South Africa: http://ilam.ru.ac.za/moa/moa030.htm. Some of these recordings bear a striking resemblance to the American recordings of Sid Hemphill. recorded by Joel Laviolette around the year 2000. Joel teaches how to make and play panpipes in this tradition at workshops around America, particularly at Zimfest. Currently, traditional instruments in this style are made out of plastic plumbing tubing, softened over a fire and worked by hand, rolling the end of the pipe until the pitch is correct. Southern African nations never had a substantial slave trade with the United States, and so it is unlikely that the tradition came directly from these tribes in southern Africa. The instrument may have had greater spread in west Africa in previous centuries and died out or was not documented before modern times. Are there any original surviving quills? Lomax reports that when he revisited some of the locations where he had recorded Quills players, the tradition had pretty much died out. I hope that there are still some players from that tradition, and the skills of making sets of quills has not died out entirely, however I am not aware of any. I also hope that older instruments still exist. It seems reasonable to think that these instruments survive, perhaps still kept in the family of the players, and perhaps in small museums in the south. If you know of the location of any, please let me know! I was told by banjo scholar Scott Odell that the collection in the Smithsonian once contained a set of Quills that had been donated in the late 1800s along with a Mountain Dulcimer. Its current whereabouts is unknown, and it may have been lost. Only a few players have been recorded playing an instrument called the quills prior to the folk revival. Big Boy Cleveland, Gennet 1927. Henry Thomas, Vocalion 1927 and 1929. Sid Hemphill, recorded by Alan Lomax in 1942. Alec Askew, recorded by Alan Lomax in 1942. Othar Turner, who played and made cane flute style instruments for the Smithsonian folk festival on the mall in Washington DC. Cleveland’s Quills Blues can be heard at this site: Document Records (search for “The Songster Tradition 1927 – 1935”. It is likely that Cleveland is actually playing the cane fife (also called the quills). Black Fife and Drum Music in Mississippi. Othar Turner, Cane Fife Maker. and the short film Gravel Springs Fife and Drum. Sid Hemphill and Alec Askew were recorded by Alan Lomax, and their playing is included in the Alan Lomax collection, Southern Journey, Vol. 1. A clip of Hemphill’s playing can be heard on Amazon.com’s page for this recording. Another interesting recording is Traveling Through the Jungle, which features a different performance by Hemphill. There is another recording from Alan Lomax’s field recordings featuring Alec Askew playing the “4 hole quills” included on the Document CD Field Recordings Vol 15 (DOCD 5672), where Lomax asks Askew to play the individual notes–this makes analysis easy, and I’ve included the tuning of this set of pipes in the article Reconstructing the quills. By far, the most information we have about this instrument comes from the early blues recordings by Henry Thomas. I became interested in the Quills because I study woodwinds, and some friends who listen to (and play) a lot of early blues played Thomas’s “Bull doze Blues” for me. That’s about all it took–Thomas’s music is so strong and vibrant, even through the medium of a 78rpm recording, that I was hooked. We started to discuss what it would take to build a set of pan-pipes as close to Thomas’s as we could. Thomas left little in the way of documents about his life, and no sets of his instruments have survived. I’ve heard that some instruments cataloged as Quills can be found in small, southern museums, and I have heard a rumor that a set of quills was donated to the Smithsonian in the late 1800’s along with a dulcimer. The quill’s whereabouts are currently unknown however. What this means is that we are left to apply some of the techniques that I’ve learned to reconstruct historical European woodwinds. In this case, there are no pictures to go by, but in this case we have something much more valuable, actual recordings of the instrument. During his recording career, Henry Thomas made eight known recordings using the quills for Vocalion, recorded in 1927 and 1929. These recordings can be heard on two collections: Texas Worried Blues (Yazoo), and Ragtime Texas (Document). I have written to Document to ask for information regarding the instrument shown on the cover, but received no reply. I assume that the instrument shown is an example of the style, but not an instrument linked in any way to Thomas. (I would love to learn otherwise!). Some clips can be heard on the Amazon site for both these recordings, including several tracks that feature the Quills. Some of these, such as Bulldoze Blues, and Fishing Blues have become blues classics. How do I get a set of Quills? As far as I (or anyone else I’ve asked knows) you make it. African players make their own instruments, and I imagine that Henry Thomas did as well. Cane does not survive well, and there are no known surviving panpipe style instruments from the old days. Fortunately, we have a great deal of information in the form of audio recordings, which we can study to determine fairly precise measurements that will allow us to reproduce the instrument that Thomas played. We can learn a great deal about the instruments from these recordings. I did some research on that subject which can be found in the article Reconstructing the quills. See the post The Quills: the forgotten American folk woodwind for general information about the American instruments known as the quills. African players make their own instruments, and I imagine that Henry Thomas did as well. Recent players of the cane fife in America do so as well. So, what do you need to know in order to make a historically accurate instrument? First off, you need to understand the difference between the cane fife (quills) and the panpipe form of the instrument, and decide which one you want to pursue. There are modern players and makers of the cane fife form of the instrument, so for the moment I’m going to concentrate on the panpipe version made famous by Henry Thomas. There are no surviving instruments identified as American (pan pipe) quills. I was told by Smithsonian conservator and banjo scholar Scott Odell that the collection in the Smithsonian once contained a set of quills that had been donated in the late 1800s along with a mountain dulcimer. The dulcimer survives, but the current whereabouts of the quills is unknown, and may have been lost. Fortunately, we have a great deal of information in the form of Thomas’s audio recordings, and we can study these to determine fairly precise measurements that will allow us to reproduce the instrument that Thomas played. I started with the classic Bulldoze Blues, which stands out for its especially well played quills part. Here is a short except from Bull Doze Blues in case you are not familiar with the song. I first listened to the piece to determine the number of pipes, and then applied audio analysis tools to a digital recording of the song in order to determine the exact pitch of the pipes–some of them sound for too short a period of time (for me, at least) to get an accurate feel for the pitch of the pipe by ear. This worked fairly well, and I was able to determine that 8 different notes were sounded, so that the instrument contained at least 8 pipes. I had less luck with the audio analysis. I used the Spectrum tools in Sound Forge, but some of the notes sounded for too short a period of time still to get an accurate rendering. This was obvious after I had made some bamboo prototypes (thanks to some generous neighbors who let me raid their bamboo patch). Although the pipes were tuned within .25 Hz. using a frequency generator and an oscilloscope, the finished instrument did not play well with the original instrument – clearly, something was wrong. I decided to make larger samples for analysis by condensing all notes of a particular pitch into a single file. This proved to be an straightforward if time consuming task, again using Sound Forge. I simply worked my way through the master file, and clipped each quills note, and appended it to a file that held other notes of the same pipe. The approximate pitch is just that–approximate. When playing the quills, it is possible to play the pipe so that it’s pitch varies a considerable amount. It is also possible that the record it’s self was pressed slightly off center, causing different notes to playback at slightly different frequencies. In any case, the record is what we have to work with, and it is a starting point for a more accurate analysis. This time, I selected the entire body of each one of these audio files, and subjected them to Sound Forge’s Spectrum Analysis tools. The results are shown below. You can click on each graph to view a full-size image. Pipe 1 The note is split into two peaks at 676 and 687. When analyzed by ear, the pitch seems to fall around 680, which makes sense, since the ear tends to average out rapid variation in pitch. Pipe 5 There is some variation and “flutter-tounging on this note, which gives a range of perceived pitches. I’ve chosen 1055 as the strongest note heard, but you might feel otherwise. The pipes play sharp when the player blows harder, and that is clearly what is happening in some of the samples used to make this track. Pipe 7 Another short sample with two nodes. Although the peak is on the lower node, the note sounds higher, as shown to the right. As you would expect, the pipes with the longest samples provide the most accurate results. The recording of Bulldoze blues plays back a bit sharp of the key of Ab. It is said that Henry Thomas played with a capo high on the neck of his guitar, so this is very possible. It is also possible that the recording machine ran a bit slow, which would have given a faster sounding performance and a higher pitch. This was done on occasion by 78 rpm recording engineers to add more punch to a recording by making the player just a bit faster than they were in real life. If this was the case, and the recording was as much as a semitone sharp, the key of G would be a reasonable guess for the original key of the song. Using the key of Ab major pentatonic, what notes do the pitches determined above give us? Eb (6th octave) 622.25Not represented in this octave. Why is the first pipe so “out of tune”? It is likely that the whole set of pipes is tuned a bit sharp (or the cutting lathe for the recording was running slower than 78 rpm). Even considering that ,one oddity that stands out – the first pipe plays a E, and the 6th pipe plays an Eb. This causes some problems when determining the scale and mode of the instrument, although I’m certain it did not bother Thomas at all–the sharpened E is always used to slide into the F pipe, and is never played on it’s own. In other words, it might be a “blue” note, used for effect. It may be that cane was not available in a proper size for a longer pipe to play Eb, or it may just be that this is the effect that Thomas wanted. In any case, it works very well in the context of the song. The Eb in the second octave is played as a true scale element, and is used much more often (10 seconds total, compared to 2 total for the first pipe). For ease of playing with other instruments such as the guitar, it makes sense to assume that the recording is about a semitone fast, and that the first note is un-intentionally sharp. If you take the values shown above and drop them by about a semitone, and flatten the first pipe to match it’s octave, you end up with a pentatonic scale in the key of G, starting on the note D. This is a very reasonable pitch to use for a set if all you want to do is play quills. Given those pitches, we still need to know two things before we can make a pipe – the length of the pipe and it’s internal diameter that would provide the pitches shown in the chart. Since there is no easy way of calculating this, I did some empirical research on the physics of stopped pipes which can be found at the following page: The Acoustics of Pan Pipes. The numbers are far more precise than are needed for an instrument made out of a irregular material like bamboo. The bore can be a good bit larger or smaller (experiment with what gives you a good, strong sound). You should start each pipe longer than you think you need by at least a couple of mm. You can always make a pipe shorter, but never a longer. One way is by melting wax into the pipe to raise its sound. If you do that, don’t leave the instrument in a hot car. The hard way: what size pipes match the recording? On the other hand, you might just want an instrument just like Thomas used. Knowing what we know about the acoustics of stopped pipes, what would this set of pipes have looked like? The first step here is to figure out what size pipes (length and width) would provide the pitches shown in the chart. Since there is no easy way of calculating this, I did some research on the physics of stopped pipes which can be found at the following page: The Acoustics of Pan Pipes. Based on the information on that page, the following values look like good starting points for making a reproduction of Thomas’s instrument to match the pitch of the recordings. What material were the quills made of? Now that we know how many pipes were in the instrument and roughly what the length and diameter of the pipes would have been, the next step is to find the appropriate materials. Many historical sources that mention the quills mention that they were made of cane. In the American south, this can be only one plant–Arundinaria Gigantea, also known as Southern Cane, Switch Cane, and Canebrake Bamboo. It is the only native bamboo found in North America, and is common in southern states. For more information, see the page: Cane. Given a pitch, what is the ideal internal length and diameter of the pipe? Since cane is a natural material, it will not conform to the precise dimensions defined here, however these numbers should provide a reasonable starting point for experimentation. Given a sea level speed of sound of 345 meters per second, this produces the values shown in the following graph. The red line is an idealized curve of all notes between F#3 (261.63) and A#6 (1864.66). The dark blue indicates values physically determined from cut Lucite tubes, and the green line are the intervals from Henry Thomas’s Bull Doze Blues, which is a early blues recording featuring the rare American panpipe, the Quills – which is what got me thinking about this in the first place. The following is the table used to calculate the values for the idealized curve shown in the graph above. I’ve found that a ratio of between 10 to 1 and 15 to 1 for length to bore works well. I have been using 11 or 12 to 1 in my experiments, and 11 to 1 is used in the example above. Good sounding pipes can diverge from this value and still sound well, which is a good thing because bamboo or cane is rarely exactly the size you need.